Remember those teachers who never deviated from their lesson plan, who delivered meandering, protracted lectures siphoned directly from the narrow minds at Harcourt Brace? It seems my entire education was dominated by rambling right-brained soliloquies like these, making the study of biology or math or even art an act of intense, unquestioning regurgitation. If only I had had Kim Abeles as my tutor, someone who could translate language and concepts visually, I would’ve been as content in the education assembly line as Laverne and Shirley’s glove. Kim Abeles is equal parts artist, activist, storyteller, and scientist, making her the best kind of public educator. A socio-political nature and an interest in the cultural self-image drive much of her work. She has spent most of her career exploring and explaining issues of immediate social importance, from AIDS to ecology, from labor relations to racism. She tries to reach an audience as expansive as her causes, making her art into a user-friendly soapbox whose vantage point can be just as relevant and empowering for the audience as it is for her, the artist. While Abeles’ art has employed a myriad of forms, including sculpture, assemblage, and photography, detailed research remains its dominant element. Take the series called The Smog Collection, which ended up becoming a mascot of sorts for the California Bureau of Automotive Repair, Department of Consumer Affairs. The idea went down like this: When she first arrived in Los Angeles, Abeles noticed how the horrible quality of the air obscured the view of the mountains from her studio window. Sometimes even in broad daylight she could barely see the silhouette of the range. Wanting to illustrate the effects of smog on her everyday existence, Abeles placed simple stencils on the surface of her roof and collected air particulate in the negative space. After she figured out how to get the smog to stick to a variety of surfaces, she drew on her experience in portraiture to create the Presidential Smog Plates (1992). This dinnerware featured the smiling image of every president since McKinley in the center, with each of their respective policies on air pollution scripted, in smog, around the plate’s edge. 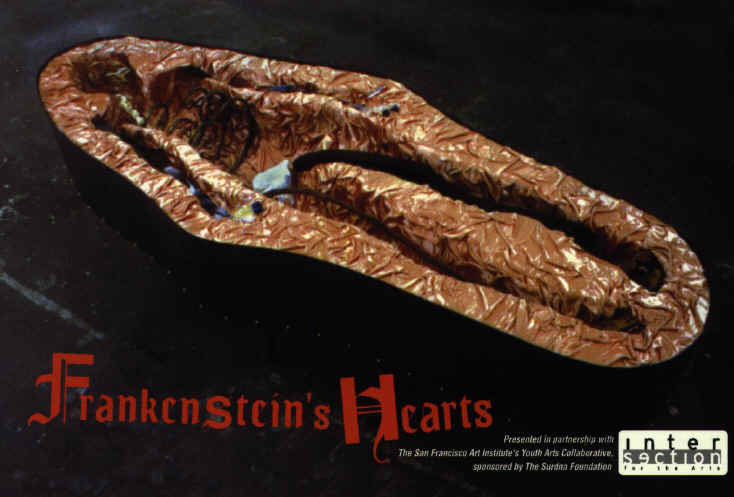 Frankenstein’s Hearts, Abeles’ latest installation, continues the idea of portraiture. Her passion for the collaborative process of art merges with storytelling and sculptural assemblage to produce a visual narrative of life lived through several decades, a multi-layered display of love stories, war stories, and immigration stories. The project arose from a partnership with the Youth Acts Collaborative of the San Francisco Art Institute, kids from St. John’s Educational Threshold Center, and Abeles’ current students at Cal State Northridge, as well as local artist Therese Buchmiller. It uses illustration, assemblage, and written documentation to translate stories from the community’s elders into a collective visual language directed toward the project’s centerpiece: a large satin and copper sarcophagus. While Abeles’ work has been exhibited throughout the United States, as well as Canada, Belgium, The Netherlands, Slovenia, Spain, and the Czech Republic, this is her first solo exhibition in San Francisco. Her work can be found at the Museum of Contemporary Art in Los Angeles, the California Afro-American Museum, and the library collections of the Museum of Modern Art and the Cooper-Hewitt Publication Design Collection of the Smithsonian. Kim Abeles is currently the artist-in-residence for the California Science Center in Los Angeles as well as an assistant professor in the Department of Art at Cal State Northridge. I guess that’s where I should’ve gone to avoid the assembly line.